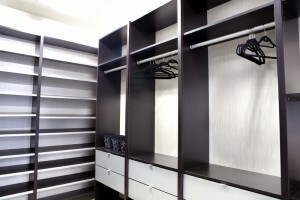 Are You Underestimating Your Closet Space? You know the feeling that comes with never having enough room in your closet for all your stuff? If you feel like your only options are shelling out for a storage unit or moving to a bigger house, there’s some good news for you. With smart organization, you can fit more into your closet than you ever imagined. All it takes is a little planning and some helpful accessories. Here are some ideas that can help you maximize your closet space, no matter how little you have. Start by getting rid of anything you don’t need. This frees up space for the things you do. Don’t be sentimental—look at everything and ask if it’s worth the space it takes up. Old clothes can be donated or sold at a yard sale. To truly get the most out of your space, you should go through this process regularly. Use a second hanging rod. You can instantly double the number of clothes you can hang inside your closet by putting in another rod. If you have a suitcase bin, you can use it to store some of your extra things. Put seasonal items that you won’t regularly need there and put it in the back of the closet. It’ll be there when you want it, but until then, it won’t be getting in your way. Get yourself a small container—a bowl you don’t eat out of much is a good option—and use it to hold small items that you want may quick access to, such as receipts and loose change. Don’t forget the door! You can easily install some hooks or hang some plastic bins on it and put some of your belongings there. Put a dresser in the closet. Sure, this sounds like it’ll just take up more space, but how much space you have is less important than what you can do with it. With a dresser, you can fold up and store tons of clothes that you otherwise might not know what to do with. Install some shelves. Good, sturdy shelving can give you a lot more storage room where once there was nothing but empty walls. Shelves can be used to store shoes, umbrellas, books or whatever other objects you want to have in your closet while keeping everything separate and well organized. For more information, or if you’re thinking about installing shelving in your closet, please contact one of our branches listed above. USI believes that excellence in every step of the process and ensures timely completion and quality of service, time after time.